Ahmedabad BRTS is a highly ambitious project for rapid transport system developed by Gujarat Infrastructure Development Board (GIDB). 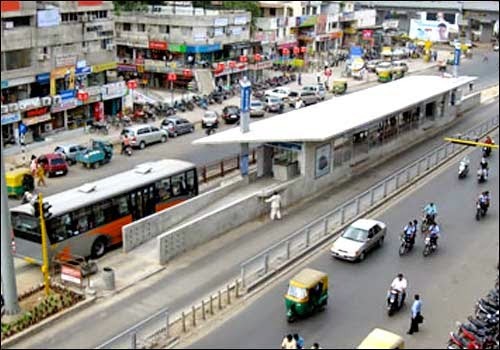 Bus rapid transit system for the city, maintained by the Ahmedabad Janmarg Limited (AJL). A part of the first phase connecting R.T.O to Pirana was inaugurated by Chief Minister Narendra Modi on 14 October 2009 and the second half of the first phase connecting Chandranagar to Push Kunj gate at Kankaria was inaugurated on 25 December, 2009. Remaining phases are under construction and will be operational by mid 2010. 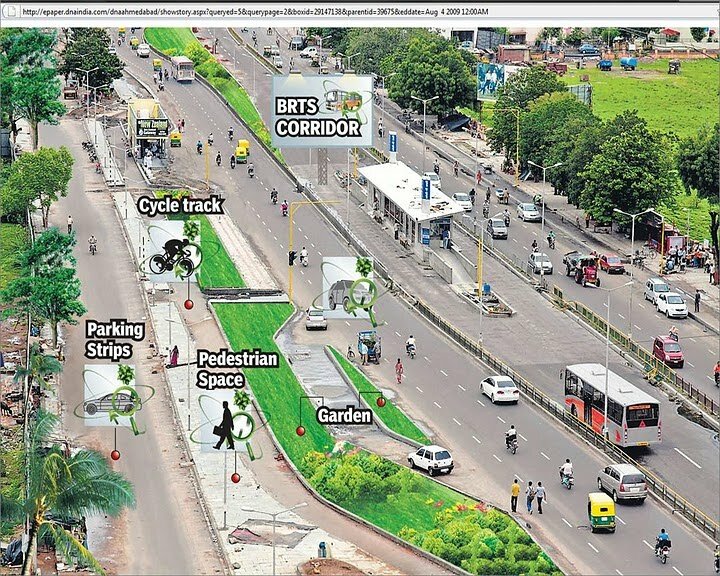 The BRTS is modelled on the International standards and proved to be highly affordable and effective in operation. It has revolutionised the system of public transport in the city. The buses are comfortable and technically advanced. The system has dedicated corridors running along the middle of the city roads in which no other vehicles are allowed. Presently Population of Ahmedabad is about 62 lakhs (6.2 million), which is likely to be 11 million by the year 2035. This would lead to agglomeration of surrounding settlements like Naroda and other smaller villages, which ultimately increases the area of the city, which may become 1,000 km2 in the year 2035. Moreover, about 1/3rd of total as well as student population reside within walking distance from the proposed BRTS network. Thus, there is a growing need for greater accessibility to basic amenities and opportunities for transportation in the city. In order to cater this future demand, the city and State Government has initiated a Plan for Integrated Public Transit System, in which Bus Rapid Transit System (BRTS) is one of the components. This will facilitate the major mobility need of the people. In future, this system will get integrated with Ahmedabad Metro by the addition of two lines running through east to west and north to south. In addition, after the implementation of Ahmedabad BRTS and MetroLink Express Gandhinagar and Ahmedabad, Gujarat International Finance Tec-City (GIFT) can be reached easily through multimodal mix of Rapid Transport Systems. Second half of the first phase of the BRTS was inaugurated on December 25, 2009, birthdate of Atal Bihari Vajpayee, former Prime Minister of India. Phase I was streched up to Kankaria Lake, to cater eastern part of the city also. It was the first time that BRTS buses crossed river & reached Maningar, the most developed area of the city. It was inaugurated by Gujarat Chief Minister Narendra Modi. Currently Ahmedabad BRTS carries around 40000 passengers daily and around 50000 passengers on weekends.